Foreign companies from a range of countries compete in Africa’s mining sector. But according to a number of measures, those from one country dominate: Canada. 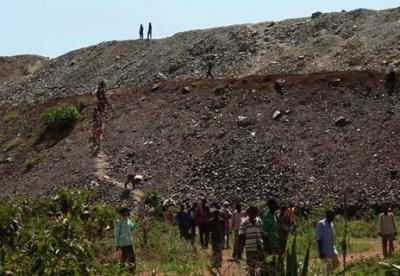 Artisanal miners being chased away from a majority Canadian-owned gold mine in northern Tanzania. Photograph by Tamara Herman. When asked to think about foreign mining contracts in Africa, many people’s minds will jump to China, or perhaps one of the former colonial powers such as the UK or France. China’s construction and agricultural projects in particular are at the core of the ‘Africa Rising’ narrative, as are the Asian giant’s more than 1.3 billion consumers. Some readers might be surprised therefore to learn that Canada – with a population less than one-tenth that of China’s and geographically about as far from Africa as one can get – has quietly grown to become one of the largest stakeholders in Africa’s mining sector – possibly the largest, depending on how you quantify it. Countries competing with Canada in African mining include the UK, France, Australia, China, and South Africa, but ranking their relative dominance is all but impossible; countries measure and declare assets and investments using different methodologies and with varying levels of transparency. However, documents provided by Natural Resources Canada seem to portray a relatively accurate picture of the country’s activities in Africa. According to these documents, in 2011 – the most recent year for which statistics are available – 155 Canadian companies were operating in 39 African countries. Their combined assets* totalled more than $30.8 billion, up from $26.5 billion in 2010. Canadian firms were most active in East Africa, with $12.7 billion on the ground in 2011. West Africa came next with $9.9 billion invested, followed by Southern Africa ($4.9 billion), Central Africa ($3.4 billion), and North Africa ($36.7 million). Ranked in descending order by value of assets, Canada’s most important mining partners in 2011 were: Zambia, Mauritania, South Africa, Madagascar, Democratic Republic of the Congo, Ghana, Tanzania, Mali, Senegal, and Eritrea. While Canada is a major force in African mining, current projects on the continent actually only comprise a minority of Canadian companies’ operations overseas. According to Natural Resources Canada, assets in Africa accounted for just 21.5% of Canadian mining companies’ cumulative assets abroad. The majority are in Latin America. However, those numbers describe just the interests of companies headquartered in Canada. Expand the picture to take into account other country’s projects financed on Canada’s Toronto Stock Exchange (TSX) and the TSX Venture, and Canada’s role in mining around the world grows even more substantial. According to a December 2012 report drafted by the TSX, during the first nine months of 2012, 89% of all global mining equity financings were done on the TSX and TSX Venture (up one point from 2011). The document states that only 7% of mining projects traded on the TSX are located in Africa, but that does not diminish the fact that a lot of money for mining sites in Africa is going through the exchange in Toronto. Shapiro notes that Canada has vast deposits of mineral wealth within its own borders, a long history mining those deposits, and is now taking this expertise to Africa. Looking to the future, he continues, prospectors tend to be moving either into less-explored low-risk areas with stable governments or high-risk regions that tempt miners with the potential of very high rewards. But in addition to a favourable private sector, mining companies are also attracted to Canada for a less-flattering reason, suggests Jamie Kneen, a coordinator for advocacy group MiningWatch Canada. Kneen explains that while countries such as the US have passed domestic laws that govern corporations’ activities abroad, Canada has not done the same. The current Conservative government has actually voted down several attempts to increase accountability abroad. One of those attempts to regulate the mining sector overseas was initiated by Member of Parliament John McKay. In April 2009, he proposed a bill that aimed to increase corporate accountability in developing countries, but to no avail. He notes that without such legislation, international corporations based in Canada are left to self-regulate their conduct and adhere to the domestic laws of the countries in which they operate as they see fit. Indeed, as Pierre Gratton from The Mining Association of Canada notes, Africa’s mining sector is expected to continue to expand, and Canadian interests on the continent to grow with it. PreviousPrevious post:Nigeria’s APC: A Progressive Change or A Powerless Coalition?